Marital Status : Married, one son. 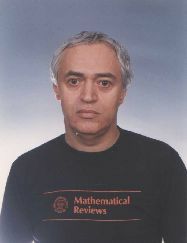 1995-present Research worker, rank I, Centre for Mathematical Statistics. Research interests: Probability, Stochastic Processes, Real Analysis. 1990 - Awarded prize of the Romanian Academy for contributions in the theory of branching processes. Addresses to international scientific meetings in Brasov (Romania) (1971, 1974, 1977, 1982), Vilnius (1973, 1981), Cluj (Romania) (1996), Balatonlelle (Hungary) (1999), Budapest (1999). Short visits (1 to 3 weeks) abroad under the exchange agreements of the Romanian Academy: former Chechoslovakia (1972, 1977, 1982), former USSR (1973, 1976, 1981), Poland (1983), Austria (1984, 1994), Sweden (1997) Hungary (1999). Salzburg (1984, 1994), Uppsala (1997), Göteborg (1997), Stockholm (1997), Graz (1998).